I finally got a picture of the hawk who's been around here for some time. well today he caught his meal and stayed put for me to get a few shots. Wow, super shot! I love this in b&w.... it makes the patterns on his feathers really stand out! Great capture Bruni! Love the detail and the b/w makes it a really strong picture. is this the same bird you have posted several times? he must be your totem, Bruni. what a wonderful photo! I agree with everybody. The B&W makes the shot. Terrific catch and composition! Awesome Black and white, the combination of strong Black and white and the contrast. is great. I love this in b&w, bruni. Great catch and angle of him. Wonderful photo . . beautiful bird! I think you have a Cooper's Hawk there! Wonderful shot! @catsmeowb Camille I'm not too sure..but it could be..they look so much alike only that these pictures were taken in the snow while the others were taken in the fall sometimes. @bruni The subject looks B&W. The only other color would be the grass and in this shot it looks black too. @grammyn yes so the color must have changed when I brightened the picture. maybe a litle too much..I'm still learning. I do appreciate your comments and suggestions andor criticism. @theanamumdiary Yes it's very very cold..yesterday when we went into the forest for picture taking my fingers almost froze..it was at least minus 8 celcius and aweful windy..today not quite as cold...maybe -3. Great captures Bruni! It must have been a great experience to photograph him! Lovely! BW suits this shot perfectly! I've been trying to get a shot of the one we have hanging around, but no luck yet. Good one here Bruni. @digitalrn Just look out for him...your time will come. I was so frustated a few days ago when he was sitting in the tree in front of our window..but by the time I grabbed the camera and focused I was too late. @pyrrhula Thank you Pyrrhula..I have tried a few times couple of days ago..but he always took off..so this time while he was feeding he stayed round for me to take 45 shots. I get so excited when I see a hawk! T hey are so majestic. Love the b and w! What a wonderful photo of this one ... do you know what kind of hawk it is? No Terry the closest I could come up with byl ooking into my bird book is the broad`winged hawk, but I'm not sure. 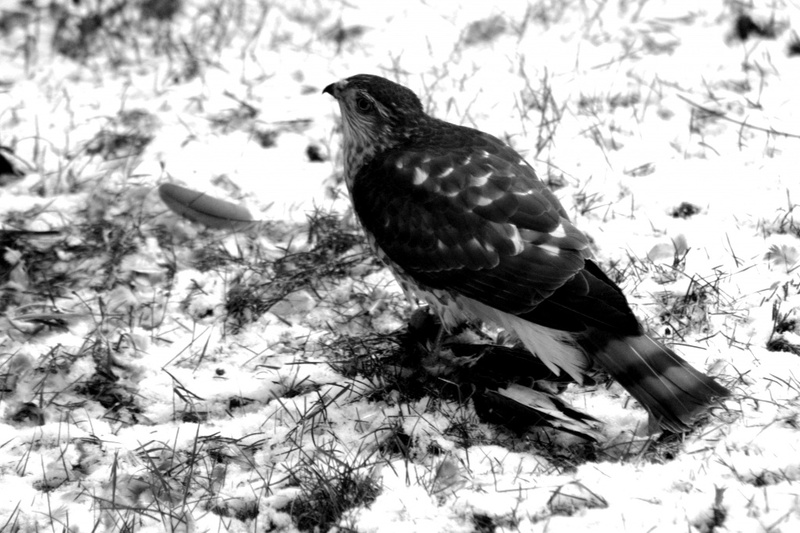 @bruni Just found a comment from Sandra M. profile name msk1p2..she thinks it's a cooper's hawk.